Well lit with a nice view of the lagoon, Core is a favorite spot among undergrads. There are three tiers offering social and solo study options. 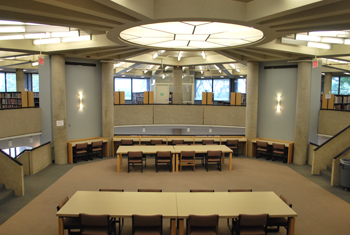 The bottom level has 10 reservable study rooms for individual and small group study. Reserve a Core study room. 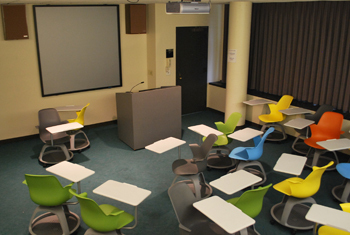 The main level has a project room, perfect for larger group projects. Reserve the Core project room. 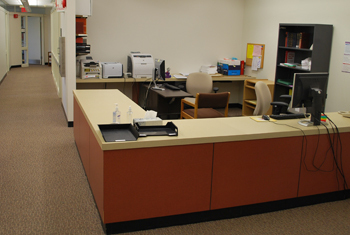 Office space for many of the library's subject specialist librarians. 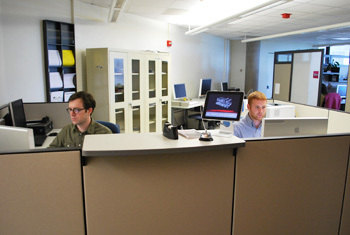 Repository and Digital Curation provides digitization services and support to faculty and graduate students and is responsible for the development and administration of the Library's digital repository. For more information about the work of the department, visit the Digital Collections page. For a full staff listing, visit the staff directory. A&RT is a department of NUIT. It supports faculty as instructors and researchers. 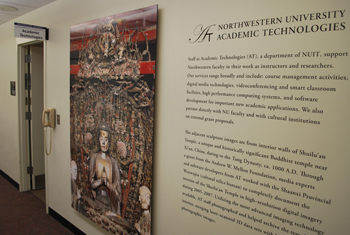 Additionally, it provides the larger Northwestern community access to educational technologies and various multimedia resources. Café Bergson is located in University Library and is the perfect spot for a cup of Metropolis coffee, along with freshly made sandwiches, bakery items, salads, sushi and more. 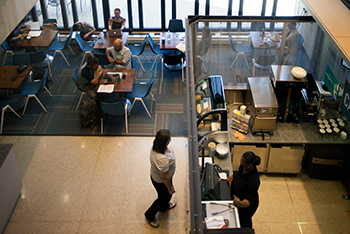 An ordering counter is accessible from the Library Plaza so you can enjoy your coffee on the go or in the outdoor seating area. Café Bergson accepts cash, credit cards, Wildcat Points, Meal Equivalency and Cat Cash. It holds a video library with over 30,000 DVDs, including everything from documentaries to popular films to television series. Facilities include 8 self-service viewing stations. Multimedia group viewing can also be arranged through the Center. 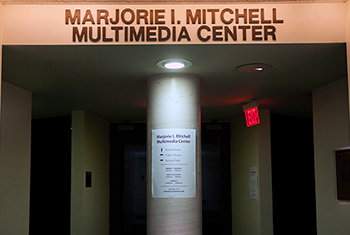 For more information, contact Mitchell Multimedia Center. 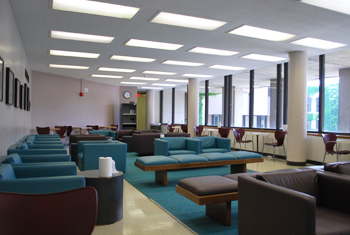 Located on the same level as Core, the Student Lounge is the perfect place to enjoy a snack with ample seating, power outlets and vending machines. Seats 30. 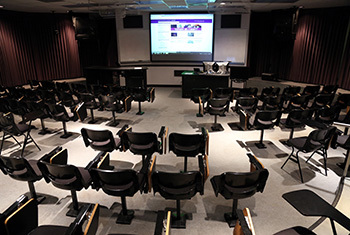 For information about reserving the room and equipment available, visit the Video Theater page. Seats 67. For information about reserving the room and equipment available, visit the Forum Room page. The Writing Place offers peer writing consultations to assist members of the Northwestern Community throughout the writing process. For more information on services, or to schedule a consultation, visit the Writing Place website. Northwestern Career Advancement offers career-related advisement at this location on a drop-in basis with no appointment required. Academic Support and Learning Advancement supports Northwestern undergraduates in achieving their full academic potential by providing course support, peer tutoring, and leadership training. Many of the programs and services offered are based off of the peer-to-peer model. Visit the website or contact alsa@northwestern.edu for more information. Many of the Libraries' subject liaisons are located here. Members of the Research Services and Instruction & Curriculum Support departments provide general and specialized research, library instruction, tours, and workshops. To contact a staff member, email library@northwestern.edu. The Libraries provide guidance and support to faculty and students who are conducting and disseminating research. We have experts in the areas of copyright, digital humanities, data management, citation management, and digital publishing who are available to assist you with your project in any stage of the research process. For more information, visit the Scholarly Research Services page, or contact a team member directly.